iDid: Proximity Alerts : iDid Inc. Alert me when my friend is near me. Alert my friend I am near him/her. Alert me when my friend is in or near a selected place. Alert my friend when I am in or near a selected place. Alert me when my friend is near me: To set this up, select Map Mode and then Locate Friend or type your friend’s name in the search box. Click on your friend’s marker and select Alert (the bell icon). You’ll get the Create Alert window. Select the distance within which you want the alert to be originated. Select Alert Me and hit Done. Alert my friend when I am near him/her: Select Map Mode and then Locate Friend or type your friend’s name in the search box. Click on your friend’s marker and select Alert (the bell icon). In the Create Alert window, set the alert distance and select Alert My Friend. Hit Done. Note that a text message will be sent to your friend to alert your friend. You can set this alert for anyone with a mobile number who can receive text messages. Alert me when my friend is at or near a place: To set this up, select Map Mode and pan/zoom to the place or location or enter the address in the search bar. You may want to use a comfortable zoom level so that you can pick the location accurately. Long click on the location or if you used the search bar, click on the location’s icon. You will be taken to the Create Alert window. If the location you selected has an address, it will be displayed. Select the distance within which you want the alert to be raised. Hit Select Friend and from the Contacts screen pick your friend. Select Alert Me. Hit Done. You will be alerted when your friend is within the selected distance of that place. Alert my friend when I am at or near a place: To set this up, select Map Mode and pan/zoom to the place or location or enter the address in the search bar. You may want to use a comfortable zoom level so that you can pick the location accurately. Long click on the location or if you used the search bar, click on the location’s icon. You will be taken to the Create Alert window. If the location you selected has an address, it will be displayed. Select the distance within which you want the alert to be raised. Hit Select Friend and from the Contacts screen pick your friend. You can pick any friend from your contacts who has a mobile number and can receive texts. Select Alert My Friend. Hit Done. 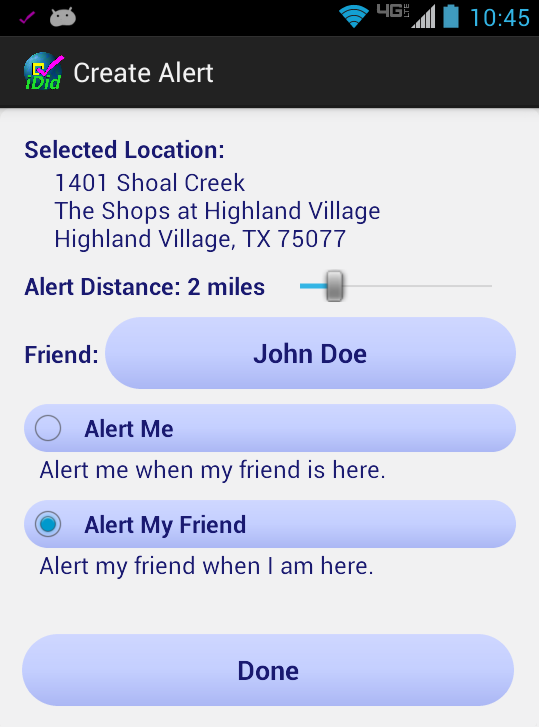 Your friend will be alerted when you are at or near the place selected. Note that this is a great way to give your friend a heads-up if you are driving to meet him/her. All alerts are one time unless reset. To see what alerts are currently active, open the menu and select Settings. Then choose Show Alerts. You can cancel any active alert from the List of Alerts screen.